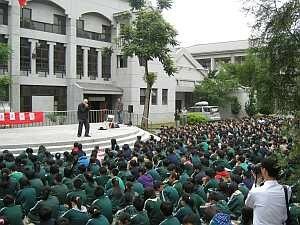 In April 2010 I did a 10 day concert tour of Taiwan. It was organied by Mr Li from Yellowstone Music. Mr Li is a major figure on the Asian Harmonica scene, as a teacher, promoter and master player. The schedule was 3 concerts, plus workshops and school visits. I was lucky enough to perform with the excellent Judys Harmonica Ensemble, shown in the picture opposite and the one below. The group comprises 3 chromatic harmonicas plus chord and bass harmonica. They are known throughout Asia. Mr Li is the Chord player, on the far right in the picture. In addition to the Judys Harmonica Ensemble, I was also backed by the MAJAM Jazz band, shown with me in the picture with the flowers (given to us after the last concert). These guys were really good, we had a great time on stage. A concert highlight for me was the banner which Mr Li made, shown in the top picture. No mistaking who was on stage. A major tour highlight was the school visits. I went to a number of shcools in the Nantou area, playing a short concert at each one. Some of the crowds exceeded 1000, the concerts started a little after 8:00 am. Despite the early start, I greatly enjoyed the experience. Many school students learn harmonica, one of the primary schools was having a concert day when I visited. The players were very charming, particularly a young quartet. Players to watch out for in future. While touring Asia as a player has long been an ambition, I’ve never been able to see how it could work. Now I know: the answer is Asian auduences, who are prepared to attend harmonica concerts. This is perhaps due to wider appreciation of the instrument, compared to Western countries, plus greater availability of teachers and hence students. 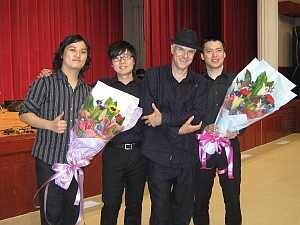 Mr Li has an impressive teaching activity in Taiwan, some of his students have become master players and teachers. I also met Mr Li’s teacher, a great honour. Harmonica students, along with parents and friends certainly helped the concert crowds. In short the tour was great in all respects. I hope to return soon.